emeraldemon: J3(a), midway between the two groups, linking them into one supergroup. jvloenen: Finish the sequence, and helping our other group seems to be right to me too. I suggest K3 (b). FireclawDrake: L4 could be an interesting move, aiming at connecting up top. Herman chooses L4 (c): There is a lot of aji in this position from the push through at O3, making L3 sente for white, with no good response to it for black. This move protects against that aji, while putting pressure on the white group (as emeraldemon already pointed out earlier, if black plays S2 white only has one eye in the corner. If black plays K3 (b), white can play L4 and black will need to defend at either L3 or O3, which is painfully submissive. If black plays J3 (a), white can play L3 and black will be stumped for a good reply. This move pretty much forces white to make a bamboo joint, after which black can decide how to further handle the bottom half of the board. emeraldemon: E3 (a) build a base. fractic: The bottom is already flattened a bit so let's take the corner with C3 (b). jvloenen: Another possibility I like to add is E2 (c). unkx80 chooses E3 (a). I don't really know which of these three moves are the best, but probably c is inferior compared to the other two moves. emeraldemon: G4 (a) joseki, no? thanatos13: since (a) is definitely the only real move (other than a silly tenuki). I would call me doing this a bump. unkx80 chooses G4 (a). I agree with this move, which is part of a joseki sequence. jvloenen: C6 (b). No urgent followup moves imho, so play the biggest point. emeraldemon: I still think S2 (c) is pretty important: white can play there to live in sente, otherwise they need to build another eye somewhere else. thanatos13 I will keep supporting the c6(b) point. This is the only beginning move left, so I don't have any extra suggestions. M5 (a) leaves behind too much aji. You should consider not just about destroying your opponent's shape, but also consider your own shape as well. S2 (c) is in the wrong direction. Also, I do not consider White at S2 to be sente: after White S2, White is completely alive, so the Black stone at R2 is just a fairly large endgame move. thanatos13: since we forced the other group to live, tenuki c6 (b) might be reasonable. emeraldemon: S2 (c), white can't live on the bottom after this and needs to escape. The attack should be good for black. jvloenen: B15 (d). As I cannot find a better move than (a) locally, I suggest something not suggested before. unkx80 chooses P6 (a). If we tenuki from the lower-right side, then C6 (b) is larger than B15 (d). However, I think there's unfinished business at the lower-right side - I regard and as miai, and allowing White to occupy both is quite painful for Black. S2 (c) is in the wrong direction as it induces a White move at . Antone: I was undecided between P6 and O4, I chose P6 because it's on black's weaker side, but I was surprised that nobody else suggested O4, does that mean it's a bad move ? thanatos13: ask yourself which group is stronger. the bottom group or the dragon? unkx80: Interesting. O4 is a move that I'll dismiss in no time. unkx80: Remind me to elaborate on (i) why allowing White to play is painful for Black, and (ii) how is painful for White. I do not elaborate on them now because these contain spoilers. jvloenen: The obvious S7 (a). Unkx80 please continue playing and explaining. I'm sure ThorAvaTahr was joking. emeraldemon: since the obvious move has been suggested, I'll suggest K4 again, since it seemed like an interesting idea. emeraldemon: unkx80 says "it (Q6) is probably not so good if Black cannot get the chance to play at R6". thanatos13: L5(c) looks really important to shut in the white group as (a) and (b) are miai. unkx80 chooses Q6 (a). All three suggestion contain interesting ideas, and all seem playable. I chose Q6 (a) for making something like 1 to 1.5 eye, while threatening White's eye space, and still retain the option to connect underneath at S11 (b). As for L5 (c), would you still play at this point at the bottom when either Q6 (a) or S11 (b) has been played? fractic: I think we should get Q6 (a) in while we can. jvloenen: K4 (b). This seems to be a key point for both sides to me. Put some pressure on the white group. Making miai of connecting our dragon via the center and connecting (part of the dragon) underneath. Helping black 33, so put a little pressure on the white D4 stone. Get points at the lower side. And after playing on the third line a lot, I just like to play on the fourth line now. thanatos13: all these suggestions look so good, I give the captain a tenuki just in case. c6 (c), double kakari, our dragon might look too good. emeraldemon: (d) k9, trying to get ahead. We have escape routes towards the bottom and the left. As a side note, is there a name for the shape created by black playing at k11 (e)? It has some relation to the Elephant Eye, and seems somewhat like a double Peep, but is it a good shape? If it is, may I suggest that also :) ? unkx80 chooses Q6 (a). With , I think we should settle our group, so I selected Q6 (a). I am very reluctant to play K9 (d) because it is poor shape, which results in the weak player's diagonal after White J9. K11 (e) is known as tower peep, but in this situation it is an overplay due to the weakness in the small knight's move. fractic: M3 (a). Not very original but I don't what to see a white stone here. thanatos13 c6 (b): the double kakari looks deadly and I feel that our nice little bottom right group is too strong to kill (while the white attacking group is still very weak) I would like to add that the biggest purpose of the previous move is (probably) to cut the middle right group, but it is in no real danger for the moment. jvloenen: Q6 (c). I suggest helping our dragon first, with this forcing move, before white gets a nice move somewhere around Q8. emeraldemon: J10 (d). 1 space jump, link up to R side. unkx80 chooses M3 (a). Black cannot tenuki from because White at M3 affects the life-and-death status of the lower right black group. Among the choices, M3 (a) is the only move. Black Q6 (c) is an interesting move that kept me thinking, but it is probably not so good if Black cannot get the chance to play at R6. J10 (d) is a move I would consider when playing . thanatos13: (a) H15 Cut while applying pressure. It seems logical. This also prepares an attack on the top left if necessary. emeraldemon: (b) F3, The bottom is the biggest open area now. Mramahi1: (c) c6, another option. jvloenen: (d) C3, take the corner. unkx80 chooses F3 (b). H15 (a) and G15 (e) seem premature and only serve to chase the White dragon downwards into the large open space. Besides, White does not have a lot of potential for expansion at the top. The lower left is currently the biggest place to play, and F3 (b) seems to be the correct direction. Just like F3 (b), C6 (c) also requires patching up after the approach, but having three consecutive stones on the third line forming two three-space extensions gives no very attractive move for patching up. Entering the corner at C3 (d) is a very interesting option, but I fear that White will get a strong wall outside with negative effects on the lower-right quadrant. antone: question: Would the white dragon diving up be a bad thing ? Wouldn't that allow us to profit with our own dragon by reaching the other side and get influence facing the bottom board ? unkx80: In theory, it is a good plan to drive the White dragon upwards: it costs us little, and as you say, turn our dragon into influence facing the bottom. In practice, this objective can be quite difficult to achieve directly because the bottom is very open, and the Black dragon is not very strong. Furthermore, White understands our plan and is sure to find ways to disrupt it. A key question here is when to make the influence, and how to make it useful. This is a crucial stage of the game, and I guess timing and sequencing will be key. As White has a lot of options, we need to be nimble in our response. Antone: E14(a) seems consistent with trying to stop the big white group to reach the corner. It also reaches out to our weak group. Plus It's sente. It does give white the upper right corner though. fractic: Let's just view - as a forcing exchange and move on to the other corner at C6 (b). Mramahi1: F17 (c) Attack the corner and the lone white stone. jvloenen: D14 (d). Get ahead in the number of iron pillars again. Herman chooses E14 (a). at E14 is a multiple purpose move. It strengthens the black group on the left, which was vulnerable to invasion after the solid iron pillar move by White, it threatens the top with a follow-up knight's move or large knight's move, and it works to keep the white group on the left separated from the top left corner. I prefer E14 over D14 (d) for this purpose because D14 is too slow. D14 does not have a strong follow-up at the top, and loses the battle to get ahead. I feel that F17 (c) is still the wrong direction at this time. White's potential along the top is still limited by our iron pillar. a move at F17 almost forces white to invade at C12, after which it would be hard for black to find a good move, because settling the group with B12 would be exactly what white wants, the resulting white wall would help white's group on the right. C6 (b) is an interesting move, and certainly one to consider, but I would prefer to wait and see how the top left develops before moving in this corner. Given that both sides are low, then if both are about equally strong (which is quite possibly a result of the current move at E14), the black stone at N3 is further from this corner than the one at C10, so the lower side may have more development potential in the future. unkx80 comment. D14 (d) is neither here nor there. If you want to secure the three-space extension, why don't you play D12? jvloenen: I thought about D12. I don't like it because the shape doesn't feel good to me as we haven't made the B16/C17 exchange. D14 creates a "normal" strong shape, strong enough for white to answer in the corner I thought. (Btw, I like to suggest alternatives, even if I would like to play a suggestion given before, just for this kind of explanation). jvloenen: As the number of white stones in the upper-left increase, it feels we should approach the corner: C14 (a). emeraldemon If white gets M5 (b), our group is on the run again. I wish I could find one good move to make that group safe, but this is the best I can come up with. thanatos13: since we could connect to either of our two strong groups, I like (a) much better. As a person who cannot stand to see the opponent make vast amounts of territory, I say G17 (c) is my way. C14 (a) pushes White towards the strong and iron pillar, indirectly puts pressure on the White dragon, and prevents White from extending from the upper-left corner to C12. G17 (c) has similar ideas to C14 (a), except that the direction is opposite, in which we use the strong and iron pillar as a basis for expansion. While a good idea, I think that the selected point is not very good locally. For some reason, I feel that C14 (a) is a better direction than G17 (c). M5 (b) seals in the White group in while reinforcing the Black dragon at the same time. The only problem is that the bottom side is open, so White is almost certain to play in the region of G3, leaving me wondering what material benefit Black obtained while White gets profit at the lower-left corner. Comments by Herman: I agree with this choice. I think G17 is the wrong direction, playing from strength and pushing white towards the weaker stone on the left, while C14 is the right direction, playing from the single stone and pushing white towards black's strength. M5 does not accomplish much, I think, because the black center group can still connect under at S11, so is not in any real danger. If white plays M5, I would be happy to play L4 and invite white to push us from behind. unkx80: thanatos13, with the and iron pillar, I do not expect White to be able to make "vast amounts of territory" on the upper side. thanatos13: I thought my choice looked funny. XP I like the thorough explanations. thanatos13: K16 (a) is very generic, but I doubt there is a better play. emeraldemon: (b) L17, the other side. Antone? : arrgh, this has become way too complicated for me, I'm going to go with: attack the corner from below and hope that the shoulder hit white has ignored proves useful: C14 (c). fractic: I'll suggest J11 (d), pushing white closer to her stones at the top before playing a or b.
jvloenen: I would like to play (a) myself. Another option: M5 (e). unkx80 chooses L17 (b). Since White ignored the shoulder hit with a move that doesn't put much pressure on any of the Black stones, Black should play either of K16 (a) or L17 (b). I don't know which is better, but I chose L17 (b) to emphasize on the connection with the P17 stone as well as making territory. Black C14 (c), J11 (d), and M5 (e) will all be answered with White K16. emeraldemon: It seems white wants/needs to connect to the K17 stone. I propose the shoulder hit (L16, b) to prevent that from happening. Antone? : I was thinking along the same lines as emeraldemon but was going to propose a keima at L15 (c) to give pressure on both the K17 stone and the white 4 stones at the same time without playing too near. If white replies at L16 we have the options of going M17 which is strong, If white M17 then N16, etc. Of course I'm also worried that this is just one of my typical overplays. Mramahi1: Since all groups are reasonably safe right now, maybe tenuki at (d) at C6. fractic: I like the shoulderhit at b too. But I'll also offer another alternative at C14 (e). Also a tenuki but this time focusing more on the top. unkx80 chooses L16 (b). Since all Black soldiers have already suggested, I shall make the move this time. Herman, do you want to make the next move? For this position, there are only two or three points that I am considering: C14 (e), L16 (b), and possibly L12. I chose L16 (b) to prevent the group from going home to keep Black's initiative. O12 (a) will be answered by O11 or P12; the exchange is not useful. L15 (c) has the right idea, but I suggest that it might be an underplay because it doesn't apply sufficient pressure on any White group. L16 (b) is a leaning attack technique: select a target for attacking, and then apply pressure on other groups, so as to build up bits and pieces of stones that resembles a large web for surrounding the target group. I understand this idea may be a bit hard to grasp, but you'll get to appreciate it more as you progress. C6 (d) is in the wrong direction. By the way, I find the move a bit strange. I was expecting L11 or L12, then White may be able to go home and build a framework at the same time. emeraldemon: R7 (a), gives black a little shape, squishes white. Mramahi1: L10 (b), to get a lead in the running fight. fractic: I like the suggestions so far, but I'll add an alternative at Q6 (c). This is meant as a prelude to S2. Antone? I'll put in O4 (d) to have it in the basket. Thanatos13 The two white groups look too much alive and our black group not so much, so I'll give the suggestion of a connect at s11 (e). Antone? would defending the corner at S2 (f) be very bad ? unkx80 chooses L10 (b). I actually don't know what's the best move for Black in this position, but it is easy to select one from the suggestions. Among the suggestions, R7 (a), L10 (b), and Q6 (c) are all interesting suggestions. In this position, R7 (a) and S2 (f) are basically regarded as miai which means that White is basically settled, so if Black R7 forms a base then White S2 gets the big endgame corner move, and if Black S2 grabs the big endgame move than White R7 reduces Black's possible base (and makes it more difficult to connect underneath at S11). Between these two moves I prefer R7 (a) because of the base, but given the possibility to connect at S2, this move doesn't seem very urgent, so it seems even better to play a move outside. Similarly S11 (e) is not very urgent, and S11 actually makes the three White stones light and leaves behind aji. Q6 (c) is very interesting and was outside my radar, but after White P5 or R6 I have doubts whether an effective attack can be launched. O4 (d) is intuitively not very good, not least because it makes Black overconcentrated. If you want to seal White in then the move is M5. Antone?, you originally also suggested Q11, but that move is quite bad in this context. If you want an explanation, let me know. Antone? no that's ok, I suggested Q11 because I mistakenly believed that to connect underneath you would have to start by sacrificing a stone at Q11. Then I tried it out on a board and I saw that it doesn't work that way. unkx80: It is possible to connect by sacrificing Q11, but the sacrifice gives White a free ponnuki which gives it eyes, rendering future attacks much less effective. fractic: P3 (a) is usual. unkx80 chooses P3 (a). P3 (a) is the continuation of a standard sequence. The only other move that probably merits discussion is S3. But if Black S3, then White P3, Black R4, White Q2, Black R3, White Q5, the Black O3 stone is separated, and Black is basically sealed in. fractic: I'll go with R2 (a). White will probably settle relatively easily but I don't see any real alternative. emeraldemon: Q2 (b), a slightly different shape, maybe thicker? thanatos13: Q4 (c) looks very nice. Right now, I think white lives, and our two black stones are being attacked, so this move removes a good move for white at the same place and white has to make a very difficult decision, keep a weak group, or get a much smaller living group. unkx80 chooses R2 (a). I don't think there are any good alternatives. Among the suggested moves, my second choice would be Q4 (c), but I don't think cutting off the White stone provides enough compensation for giving up the corner completely. Black Q5 will be answered with a wedge at Q4. Finally, Q2 (b) is too slack to even consider - White will simply play R2. thanatos13 N9 (a) this pushing fight favours us, although bland. fractic: I'll suggest an alternative at R7 (c). While it gives white the initiave in the center it starts to create some shape. emeraldemon: Q5 (d), just to add another. Perhaps we can cut and maybe even link black's groups. Mramahi1: I think perhaps move N9 (a) is the best, however, to add one more choice I added R4 (e). This move denies the white group eyespace and claims territory. unkx80 chooses N9 (a). A bit bland, but N9 (a) is basically the only move. Here the overriding concern is to continue splitting White into two groups and not allow White to seal in the Black group. However, the other suggestions are also interesting and merits discussion. M4 (b). Yes, this move is a better move locally compared to the previously suggested move of M5. But heading outwards is more urgent. R7 (c). This move threatens Q6, but White can respond at P4 or Q4 (among other choices), and Black is not likely to get sente. Between R7 (c) and R4 (e), I would want to play R4 (e) because the corner is larger. Q5 (d). Does this work? Even if White trades the side for the corner, it doesn't seem so good for Black because Black has already invested two stones on thr right side. R4 (e). My second choice after N9 (a). As outlined in my explanation for , Black may not be able to get sente and come back to N9 (a). thanatos13: p9 (a) is obviously good. I was thinking of a certain kikashi (and loving it), but it goes against the rules of kikashiing so I didn't X(. emeraldemon: I like R4 (d), which takes away eyespace and threatens Q5. unkx80 chooses P9 (a). kb suggests that my choice of is a mistake, which might be true given that my Go knowledge isn't current due to a lack of study. But anyway, since decided to make a one-space jump, it seems inconsistent if Black doesn't follow-up with P9 (a) to split the two White groups. White I don't anticipate immediate benefits, it seems that White will get busy having to take care of two weak groups, which can work to our advantage. Further, Black has the option of connecting at S11, something that White cannot do. The choice of R4 (d) is an interesting idea, but it doesn't seem good to me: White can play Q5 and both the bottom right corner and lone stone gets weakened; or White can play S3, Black S2, White Q4, Black R3, White P4, Black P3, and White P9, which does not seem appealing to me either. As for the choice of M5 (b), I shall just say that there is a better move locally, because Black M5 leaves a rather annoying aji at White N4. emeraldemon: P9 (a) the one-space jump. My go-to choice in positions like this. jvloenen: No easy eyespace for white and get profit in the upper-right corner. I suggest R13 (b). fractic: I also like (b) even though it might become a tough fight. I'm heading of to the EGC in a few minutes. This is probably the last suggestion I make for a week. unkx80 chooses R13 (b). I am making the selection now because the suggested moves contain reasonable moves, and I don't expect many more suggestions given that the European Go Congress is taking place. Anyway, back to the explanation. After the invasion at , it is not time to tenuki on the right side. In other words, the left side is not urgent, so this eliminates C13 (c). I think both P9 (a) and R13 (b) are playable; they just lead to different games. I choose R13 (b) because it is more active, removing eyespace from the White stone, and making a bit of immediate territory. As this is a teaching game, I shall also comment that is a good move, and the exchange of and the selected by itself can be seen as giving White a bit of advantage: before , Black can more or less secure the territory on the right side with one move at Q12; after the exchange Black can no longer secure the right side with one single move. fractic: I suggest breaking up the left side with a wedge at C10 (a). jvloenen: Attack the weakest stone: C6 (b). emeraldemon: k4 (c) is a soft threat toward the right and left bottom stones. thanatos13: since right now we have 1.5 weak groups, i say we force a move with P9 (d). Although it looks a bit overconcentrated on the right, the right white stones are too weak, i feel like a and c are miai and a white move at N4 will give black a strong bottom shape with m3. unkx80 chooses C10 (a). Actually I am hoping to approach the upper left corner at C14. The upper left corner is larger than the lower left corner for two reasons: the presence of the White extension at K17, and the presence of the Black N3 stone pointing towards the left side. In particular, I suspect that approach at the lower left corner at C6 (b) will be answered by the three-space pincer at C10 which makes a double wing formation at the same time. The lower side is low, which is not good for making territory, hence I find it uninteresting. This makes me not want to play K4 (c). I had some difficulty deciding between the remaining two choices, C10 (a) and P9 (d), but eventually decided on C10 (a) to split up the left side because the two White stones seem light and are difficult to attack for immediate profit. To thanatos13: P9 (d), being six or seven spaces from the upper right, is anything but overconcentrated. Finally, I should remark that I prefer C14 over C10 (a) because C10 does not put any pressure on any White stones, and allow White the liberty to choose from a number of moves, such as approaching the C10 stone from above or below. fractic: We have to help the corner stone. I'll suggest moving out with N3 (a). emeraldemon: the two space jump makes sense, but maybe P5 (b), trying to cut, would work? thanatos13: Cutting this early in the game? It's not going to be fixed up anytime soon so I agree with fractic on (a). jvloenen: Put pressure on white. I'll suggest N4 (c). unkx80 chooses N3 (a). I personally don't know enough to comment much about the merits of (b) and (c), but (a) seems ideal for continuing the mild attack against the two white stones, especially when is a extension from the upper-right corner so a counter-pincer by White would become something like an invasion. Besides, if the two White stones eventually do form a wall, you'd want the wall to be as far away as from the stone, because is pretty far away from the upper-right corner. fractic: I'll go for R9 (a). Combining pincer with extension. emeraldemon: How about R7 (b), a more aggressive pincer? thanatos13: I like (a) too. jvloenen: A high pincer at Q8 (c) as another choice. fractic: I'll vote for Q5 (a). Mostly because making the shimari in the other corner is so common. thanatos13: R6 (b) Invadable, but nice influence right?. fractic: I just like to play different moves in games like this. There is obviously nothing wrong with P17. There is a reason why it's so common. emeraldemon: i vote F17 (d). Seems to keep sente somewhat, nice and active. emeraldemon Since we played 3-4, playing another seems most consistent, I vote (a) Q3. unkx80 chooses (a) Q3: already two votes for this move, and that's my preference too, so let's not wait for the fourth suggestion. Captain Herman chose (c, R16). Some move cannot be discussed without spoiling the game. Here a list of moves which need commentary after the game is over. Move 43: What happens if white plays P6? Move 43: Why is Black P6 especially painful for white? Move 43: Black to play O4. The captains disagree, so a discussion would be nice. Move 45: What move would unkx80 like to play? All moves: is there a move which is not suggested, but is clearly better than the suggested moves? That is: where did the soldiers miss an important move, or had the chance to play tenuki? I wanted to play here as shown, because it is a simple move that (i) works well in combination with the stone, and (ii) it prevents the very annoying White a which I have no good answer for. Part of the reason for (ii) is because I am quite reluctant to sacrifice the stones, especially when White has not yet played at b, is because the White dragon is not yet fully alive, which we can exploit using a wait-and-see approach. And I thought that is entirely natural after . 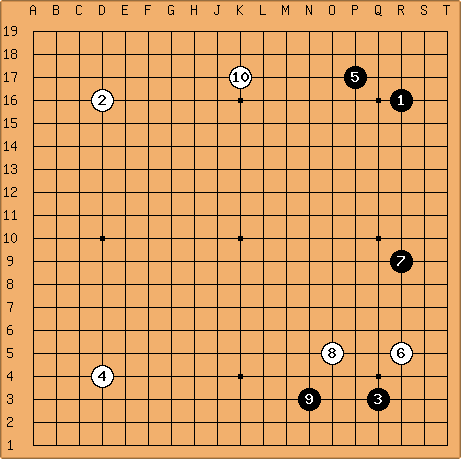 The main reason why the game sequence worked better than this diagram is because White was not able to find time to tenuki from the bottom-left corner to play at a after Black played the double approach at c. After all, Black gets a good result if White gives up the corner to capture the stones. This is why I said that the double approach is perfectly playable. But somehow I have a feeling that White could have handled this situation better, exactly how I am not sure. This makes my confidence in c quite a bit lower than than of the simple move. Remember that about twenty moves back and made the and exchange? The main reason why I said that is painful for White because it makes the exchange look pretty bad. Consider a tewari analysis where we remove the and stones. Black still plays at , White , Black , all of which are pretty natural moves. Will White now play at or a?